Each $35 box contains 10 packs. Each pack contains 7 cards. 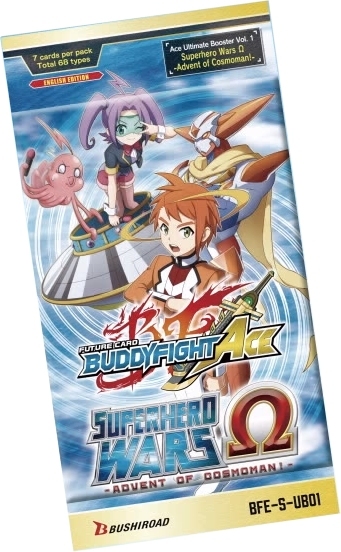 Future Card Buddyfight Ace Ultimate Booster Volume 1 - Superhero Wars - Advent of Cosmoman is dedicated to everyone's favorite - Hero World. 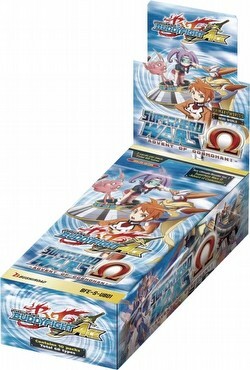 The set features cards used for building decks around Cosmoman, the buddy of Mamoru. Grab hold of victory with various superhero gimmicks! Look for 2 different special hot-stamped cards randomly inserted in packs. The set includes 68 cards (2 SS, 2 BR, 4 SP, 6 RRR, 12 RR, 18 R, and 24 U). Each box contains 10 packs. Each booster pack contains 7 cards, including 2 Rare cards (one of which is guaranteed to be a RR or better). Parallel foil versions of uncommons and rares are randomly inserted in packs.